Introduced in 2011, the Mac App Store is the largest catalog of Mac software in the world. In macOS Mojave, the App Store has been redesigned with a clean new look, expanded editorial content, and even videos of some apps in action. If you’ve already installed Mojave, you don’t have the old App Store for comparison. Never fear — check out the following figure, with the Mojave App Store on top and the High Sierra App Store on the bottom. 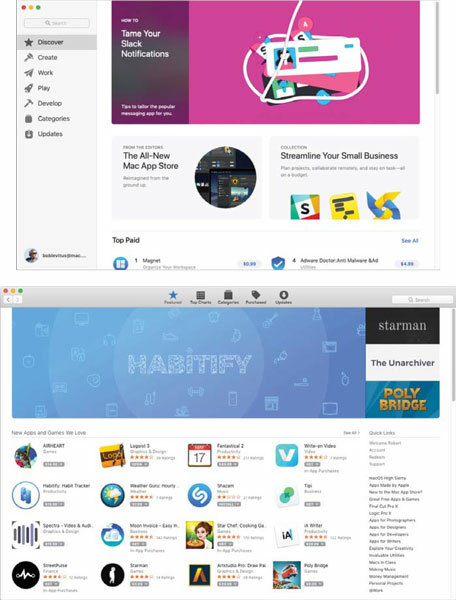 The new, redesigned Mojave App Store (top) versus the old High Sierra App Store (bottom). You’ll find interesting new apps and recently updated apps in the Discover tab. The Create tab is chock full of apps for video, audio, photo creation, editing, and more. The Work tab contains productivity apps galore. And in the Play tab you’ll discover lots of fun and games. 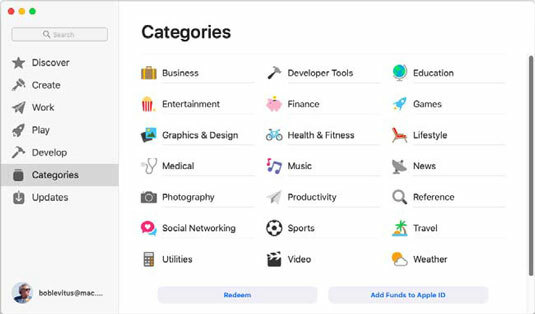 If you prefer to browse by specific categories, select the Categories tab and choose from nearly two dozen top-level categories, as shown here. The Categories tab lets you drill down from nearly two dozen categories. When you click a category, you’ll see two lists: Top Paid and Top Free. 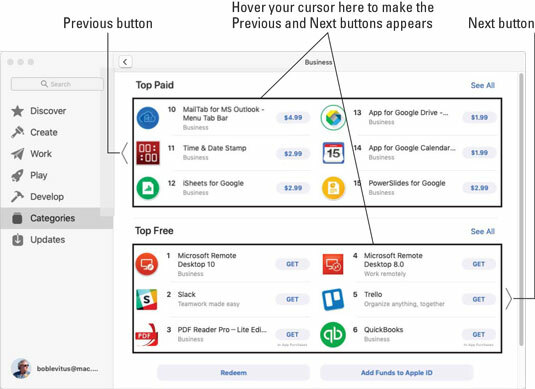 You can see only six apps at a time in each category, but when you hover your pointer over a section, Next and Previous buttons appear, looking like giant greater than and less than symbols, as shown. Hover your pointer over a section to see its Next and Previous buttons. Finally, if any of your installed apps is in need of an update, you’ll find them in the appropriately named Updates tab. If you see a little number on the App Store icon in your dock, it means that a number of your apps have updates available. Launch the App Store app and click the Updates tab to see the apps with updates awaiting them. Even if you don’t see a little number in the App Store’s dock icon, it wouldn’t hurt to launch the App Store every once in a while to check for updates manually, as the little number sometimes fails to appear in the App Store dock icon.